Slightly imperfect, sold as is only. Factory seconds are non-refundable. Please note that no coupons, discounts or other offers may be combined with the factory seconds pricing. Since we are selling these items at a loss, all sales of Factory Seconds are final. Imperfections are cosmetic in nature. 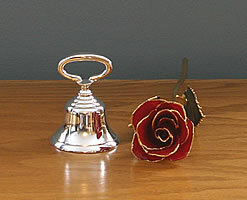 A lovely 4" hostess bell that has a heavy silver plating over brass. A wonderful addition to any dining room table. 4" high; 2 3/4 " diameter. The silver is treated with an anti-tarnish finish to keep it shining, weight 6 ounces. 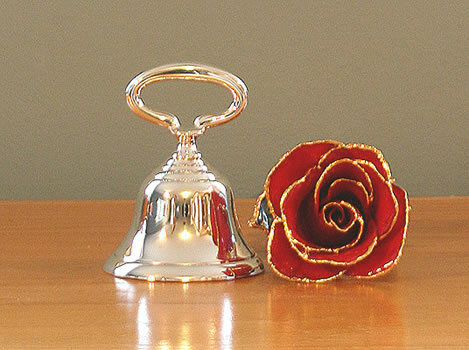 Q: I would like to know what type imperfections these bells have? A: Each piece is different, so there isn't any one answer for that. Generally, though, all of the imperfect items have small blemishes to their finishes. Imperfections are always cosmetic in nature, and do not effect the usability of the product.